Preheat oven to 350°F. In a medium bowl, stir together salt, pepper, sugar, paprika, chili powder and oregano. 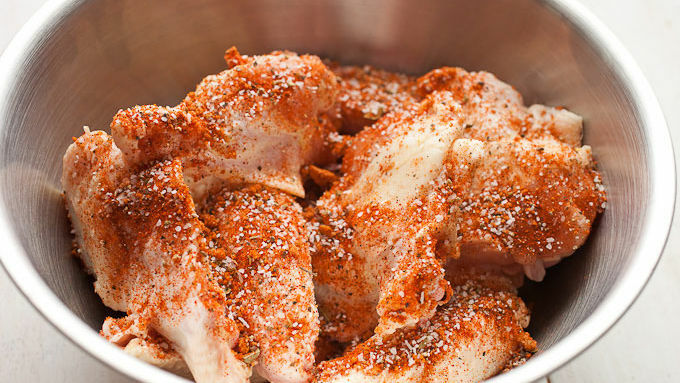 Sprinkle chicken wings liberally with this dry rub until almost completely coated. Depending on the size of your wings, you might not need all of the rub. 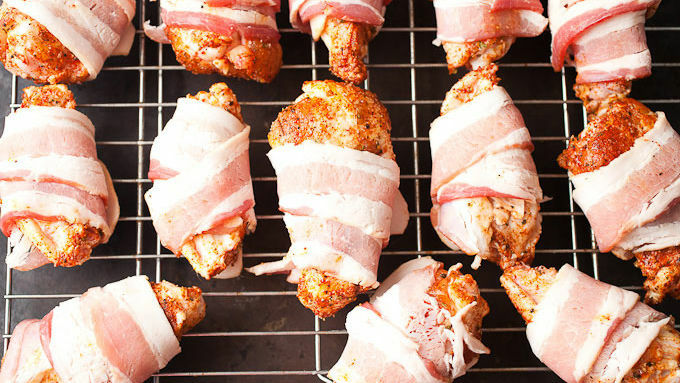 Working with one wing at a time, wrap each wing tightly with a strip of bacon. 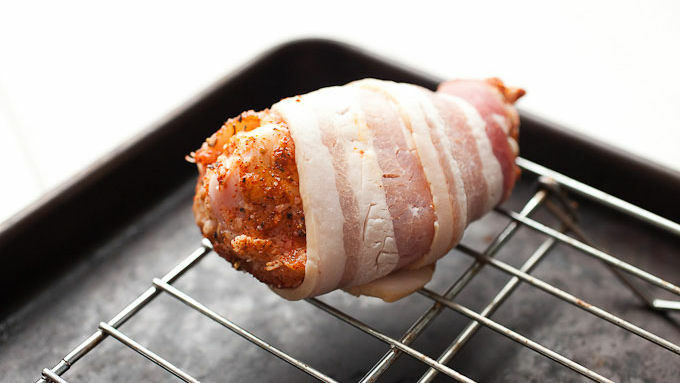 Be sure to place the loose bacon end under the wing so it doesn’t unravel as it bakes. Place wrapped wings on a baking rack over a foil-lined baking sheet. Bake wings at 350°F for about an hour, turning once halfway through to ensure even baking. Let wings cool briefly before serving with blue cheese and celery. If you don’t have a baking rack, you can cook the chicken wings on a baking sheet lined with foil. If you use this method, carefully drain off some of the accumulated fat in the sheet pan halfway through cooking. Chicken wings are one of my all-time favorite appetizers. They’re cheap, hard to mess up, and can be made in endless ways. Normally, if I’m cooking a lot of chicken wings, I’ll bust out the fryer, but sometimes baking the wings makes more sense. 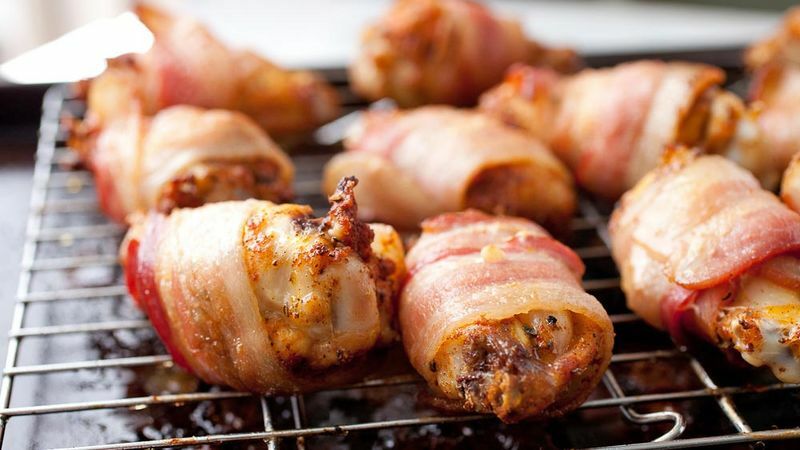 Like if you’re wrapping them in bacon! 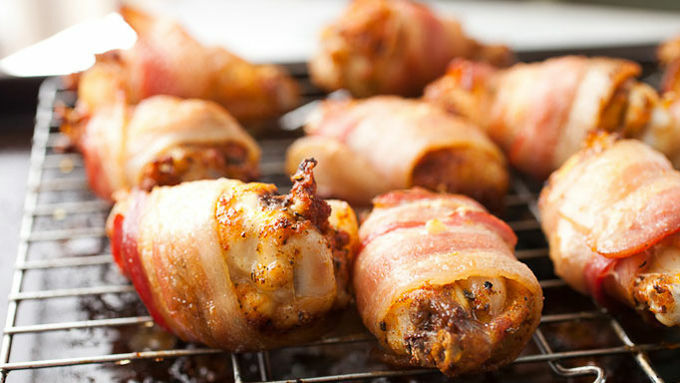 Baking these bad boys ensures that the bacon gets nice and crispy as the wings cook. Also, they’re really filling so you don’t need as many of them to feed a crowd—three or four of these pretty much makes a meal. The key to making these wings really flavorful is tossing them in a dry rub before wrapping them in bacon. I kept my dry rub really simple: Salt, pepper, sugar, chili powder, paprika and oregano. The absolute best way to bake these is on a baking rack, which slightly elevates the wings. This way all the fat from the bacon and chicken wings falls away from the wings and they get really crispy and delicious. If you don’t have a baking rack and need to bake them directly on a foil-lined sheet, carefully drain off the fat halfway through baking. They won’t be as crispy this way, but they’ll still have a great flavor. Enjoy these! I know I did.